Looking for a new recipe for the holidays? May I suggest a modern twist on a dish that is centuries old with this delicious take on bread pudding. I would go so far as to say it is the best dessert I’ve ever made. Admittedly I don’t make dessert very often, so that’s a little bit like the brewers at Zaftig saying this the best session ale they’ve ever made, but I stand by it. Not only is this delicious delicacy not very common in these parts, it lends a Dickensian aura that works well with the holidays and it pairs well with one of my favorite styles of beer, Belgian Strong Golden Ale. To top it all off this is an easy recipe that anyone can make. 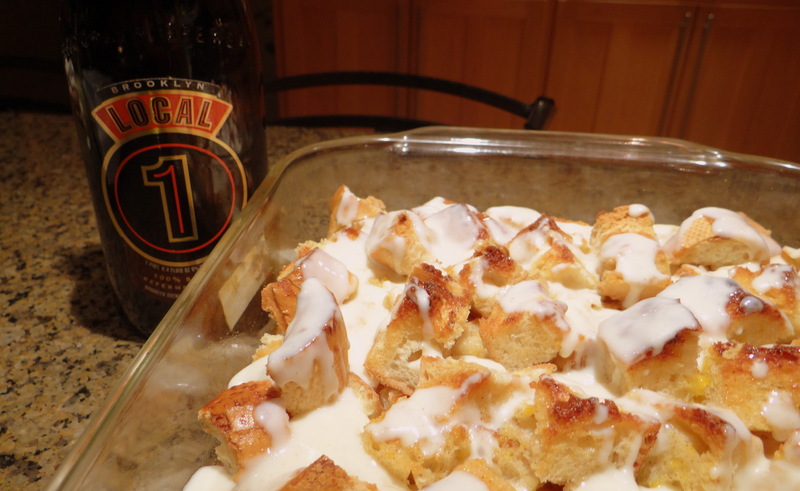 The recipe has two parts, the bread pudding itself and a beer cream sauce to dress up the bread pudding. Draft labels the sauce as optional, but while you could eat the bread pudding sans sauce in my opinion there is nothing optional about the beer cream sauce. So without further delay here is the recipe. Preheat the oven to 350 degrees Fahrenheit. Add the breadcubes in an even layer to a greased 9” x 13” baking pan. In a large bowl whisk together the sugar, eggs, buttermilk, beer, vanilla, and cinnamon. Pour the mixture over the bread. Bake 40 minutes until the liquid is set and the bread cubes are a little toasty. Combine the cream, milk and sugar in a saucepan over medium heat. Combine the cornstarch and beer in a small mixing bowl and whisk together. Pour the beer mixture into the cream and bring to a boil. Reduce the heat to a simmer and cook for about 5 minutes until the sauce thickens up, stirring occasionally. Remove from heat and stir in the butter and salt. 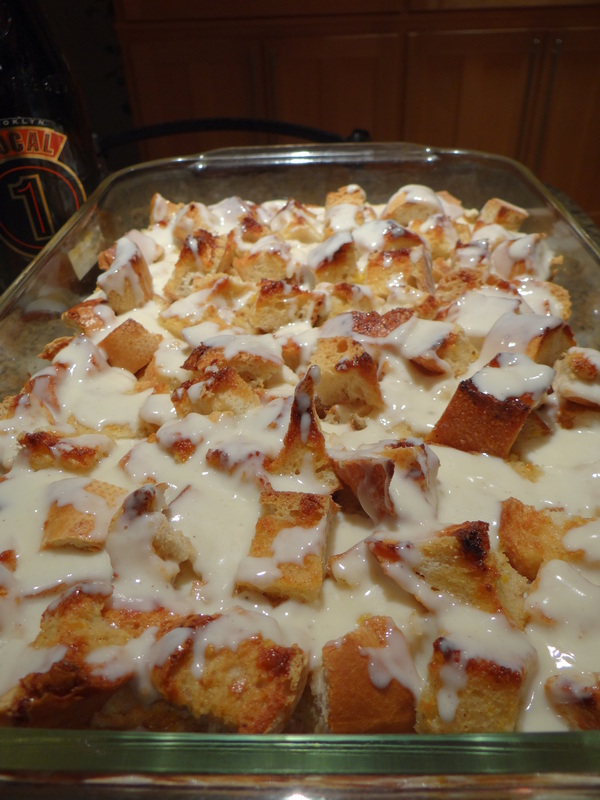 Drizzle the sauce over the bread pudding. Sprinkle the dish with a little extra cinnamon and nutmeg. I served the dish warm, making up the cream sauce just after the bread pudding came out of the oven, but I’m sure it would be good made up ahead of time and served cold. You know what they say, the proof is in the pudding, and in this case there was none left at the end of the evening. It was scrumptious and delicious. I chose to pair with the same beer used to make the pudding, Brooklyn Local #1, one of my favorite Belgian-style ales. Since there was not enough to go around for everyone I served some guests another great Belgian beer, Tripel Karmeliet by Brouwerij Bosteels. If you are looking for something more local you could opt for Wolf Ridge’s tripel, Alpha, or Rockmill’s cask aged Tripel.